We are one of the leading suppliers, distributors, exporters, wholesalers, retailers and traders of a wide gamut of Disposable Shoe Cover. These shoe covers are developed and designed at our vendors base using high quality non woven fabrics. All the shoe covers offered by us are widely used in hospitals and microbiological laboratories to protect the premises from microorganisms and other dirt particles. Being a customer focused organization, we are engaged in offering a wide assortment of Disposable Shoe Cover. All the shoe covers offered by us are manufactured at our vendors base using high grade raw material in compliance with industry laid norms and guidelines. 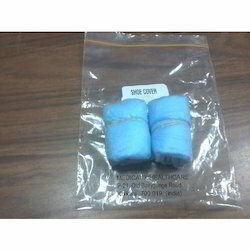 These shoe covers are widely used in hospitals to protect the area from impurities and microorganisms. Furthermore, clients can avail these shoe covers from us in various shapes, sizes and other specifications at market leading rates. Adding to this, the shoe covers offered by us are widely appreciated by our valuable clients for their excellent features such as water proof, soft and high wear and tear strength. To meet the variegated demands of our valuable clients, we offer these shoe covers in various sizes as per the requirement of our clients. Looking for Disposable Shoe Cover ?